Senator Squadron and Borough President Stringer presented their nine point plan for traffic safety shortly after the tragedy that took two young lives in Chinatown last week. CCRC applauds their emphasis on the City's need to do a better job of "working with Community Boards and other community organizations, drawing on the invaluable input that only neighborhood residents and businesses can provide. The City must respect and acknowledge community priorities such as the re-opening of Park Row, and work with local stakeholders, in order to build consensus behind comprehensive traffic management plans." We also applaud their mention in the nine point plan to "keep the sidewalks clear of street furniture, garbage, and other obstacles that infringe on public safety." This has proven to be much easier said than done in the last fifteen or so years. The struggle has been well documented in keeping sidewalks clear of merchandise. However we must caution about other recommendations to "reconfigure sidewalk space" and to "expand sidewalks". This cannot and should not be done until well after all the sidewalks have been completely cleared of illegally placed merchandise, and store facades are required to comply with the law. To start "reconfiguring" and "expanding" without first restoring existing sidewalk conditions is premature and irresponsible. 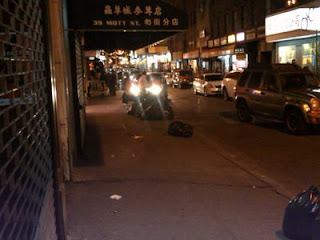 Mott St. has already enjoyed more room on the sidewalk with the recent removal of parking meters. It was suggested some five years ago that to make more room on sidewalks in Chinatown, all the City needs to do is "widen the sidewalk" that is, pour more concrete (thereby narrowing the roadway). It was a bad idea then, it's an even worse idea now. Now the suggestion is being revisited. Not only is this suggestion expensive to do (utilities are underground and before pouring concrete anywhere it is likely that those utilities must be relocated - expensive, inconvenient, dangerous!) it is also shortsighted and typical of a bureaucratic approach. As troublesome and laborious as it is to survey sidewalks, relocate utilities, and pour more concrete , for a politician it's actually EASIER to do that than to actually address the core of the problem. Why are the sidewalks difficult to navigate in the first place? 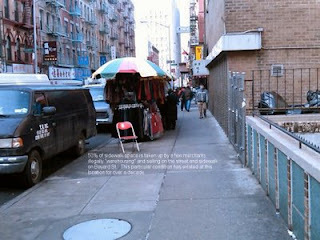 In this case the problem stems from merchants that violate the law by placing merchandise on the sidewalk. Much more difficult than pouring concrete is being the politician who ordered the crackdown on illegal sidewalk use, especially in an ethnic neighborhood. YET, we feel as though that is exactly what needs to be done. Note to the Borough President "don't take the easy way out". 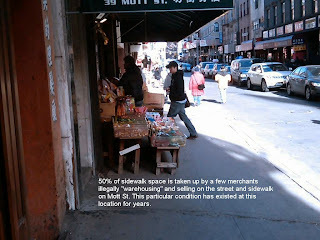 Keep the historic and authentic character of Chinatown by eliminating sidewalk selling. Nothing is permitted beyond the building facade by more than a few INCHES, on the sidewalk AND hanging from any awning. CCRC sat with the Borough President's aides in 2006 at the office of the Borough President and when asked "what can we do to make Chinatown transportation better" our response was clear, succinct, and logical : "enforce the law". The message was simple, sidewalks in Chinatown are inundated with illegally placed merchandise which severely lessens sidewalk space. The condition is rampant, although that's not the way it always was. CCRC members are all local and recall a time when merchants had closed storefronts and did business from INSIDE their stores. An influx of vital as well as vibrant businesses poured into Chinatown in the late 80's and with it a style of selling that was imported to our streets much different than the local shop keepers who for the most part lived in Chinatown. These new merchants, very few of whom were able to find a home in Chinatown, or simply opted not to live here, cared little for the quality of life of local residents and focused their attention instead on literally stopping tourists and shoppers in their tracks by placing the merchandise at their feet. This was true for plastic toys and raw fish, live frogs or handbags, all could be bought on the sidewalk without ever setting foot into a shop. Cathy Glasson, a resident and community activist continues to fight for her sidewalk space on Mott St. and despite the threats to her safety she appeared on the 6'o clock news exposing this practice, she wrote to all the papers and get this, she started doing this in the mid 1990's !!! The City of NY looks at various neighborhoods very differently, with a clear biased to some and blatant disrespect to others. When it comes to sidewalk space and the enforcement of existing laws prohibiting the selling of merchandise on the sidewalk, Chinatown is clearly in the "others" category. Amazingly the best the City has done since the illegal practice of breaking open storefronts and allowing merchandise to pour onto sidewalks in Chinatown has been to REGULATE newsracks. Newsracks?! A newsrack takes up about 1/20th the space of an illegally placed merchandise shelf or ten buckets of slimey fish, yet the City has found it necessary to regulate THAT of all things. In the meantime, merchants flaunt the system and enjoy their al fresco selling regardless of season, regardless of merchandise, and in the face of numerous city agencies combing our streets. The Borough President revisiting our recommendations to remove obstructions, but he should not implement any "reconfiguring" or "expanding" of sidewalk space without first making sure 100% of our sidewalk space has been RECLAIMED. We urge him to find a way to cut through what ever interagency red tape he has to. Pouring concrete on our streets will effectively ADD more selling space for hot dog stands, pushcarts, and more illegal selling to take place, WHILE slowing traffic , EMERGENCY VEHICLES included!!!! 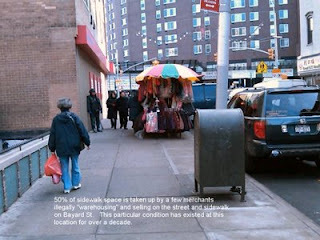 Solution to narrow sidewalk space : "Enforce the Law" clear up the sidewalks from illegal selling, and Chinatown will gain tens of thousands of SQUARE FEET !!! We're ready to feel safe again Mr. Borough President and Senator Squadron, we don't want to walk into the gutter any more, and our elderly and children deserve to be able to use our sidewalks for what they are intended for, walking not selling.